Are these healthy or unhealthy foods? Have you ever walked down the supermarket isle and saw something advertised as healthy and thought, wow that looks great! With the awareness of the importance of good nutrition on the rise, its not surprising to see manufactures starting to add healthy ingredients like Omega-3, reducing unhealthy ones like trans-fats, and advertising that plainly on the package. Unfortunately, there is usually more to the supposedly healthy food than the package tells you in capital letters with highlights. There are good and bad calories and tons of hidden unhealthy ingredients. prevalent in many canned goods as well as energy drinks. 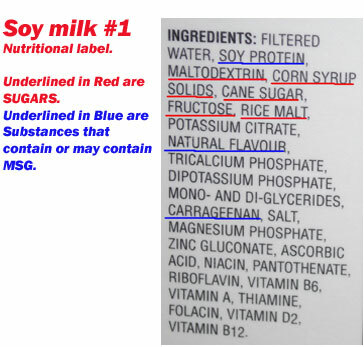 You could find it even in soy milk in a wholly unhealthy, whopping combination: maltodexrin, corn syrup solids, cane sugar, fructose, rice malt (See picture below). Some people think cane sugar is a healthy option here. It is certainly better than the next one in the list  high-fructose corn syrup, but it is still sugar. its everywhere, even in unexpected places like soy milk. I could rarely find a product not having "natural flavor" listed on the label. 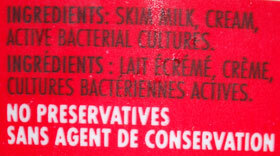 Some soy milk brands come with a mix of different MSGs, such as natural flavor, carrageenan. the main contributor to bad cholesterol accountable for 72,000 to 228,000 heart attacks per year in the US2. Those nice buttery crackers and pretzels with "Zero trans fats" may, in fact, still contain them  FDA rules allow not to report them when their amount is lower than 0.5%. Whats wrong with vegetable oils? The hydrogenation that is supposed to increase shelf life of product is also what makes them dangerous for your cardiovascular system: heart and arteries. Products with health claims often contain unhealthy doses of sodium. Even if the package lists medium 200-400 mg of sodium per serving, you still should do the math by yourself. How many servings would you eat? Daily sodium intake of an adult should be lower than 1,500 mg, and one slice of pizza contains 118% percent of your recommended daily value. Once you know the ingredients to watch, start learning about sneaky unhealthy foods. These are products youve always thought were healthy, but really arent that great. Most people know that processed foods are high in preservatives, coloring and other chemicals, but who would think that a granola bar would make it into the unhealthy food list? Many mass produced granola bars come covered in chocolate or filled with other sweets that pretty much undermine all the good healthy content they might have had. In this case you can believe the statement: No preservatives. Wonder what product is that? Plain yogurt, Balkan style. How often do you buy it? Get a second degree in Reading Nutritional Labels. Become a biochemist and understand whats inside the package. COOK AT HOME FROM SCRATCH. To avoid being at peril from a manufacturers ingredients, cook from scratch! Even as healthy food undergoes processing, it loses its nutritional value. Moreover, the chemicals used in the processing make it detrimental to your health. They are needed for longer storage, more exciting taste, and more convenient packaging - but not for you. What if you have no time to learn all the regulations and impacts of the ingredients in your processed food on your health? Your life cannot be spent on learn the ins and outs of food chemistry and manufacturing processes? The answer is... Spend your time cooking. Cooking from scratch is a necessity for eating healthy. It uses your time smartly  instead of reading labels, and referring to the long list of MSG, sweeteners, bad fats, good fats  you shop quickly, buying only wholesome ingredients. No more nutrition label pronunciation lessons required, only a healthy shopping list. It's safer. It is a creative process. it allows you more control over your body - and your life. You are in control of what you eat  and since you are what you eat, you are in control of your health and wellbeing.